As war rages in 1944, young army lieutenant Lucas Athan recovers a sarcophagus excavated from an Egyptian tomb. Shipped to Princeton University for study, the box contains mysteries that only Lucas, aided by brilliant archaeologist Simone Rashid, can unlock. 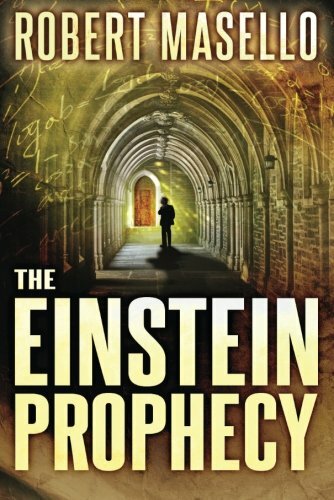 These mysteries may, in fact, defy—or fulfill—the dire prophecies of Albert Einstein himself. Struggling to decipher the sarcophagus’s strange contents, Lucas and Simone unwittingly release forces for both good and unmitigated evil. The fate of the world hangs not only on Professor Einstein’s secret research but also on Lucas’s ability to defeat an unholy adversary more powerful than anything he ever imagined. From the mind of bestselling author and award-winning journalist Robert Masello comes a thrilling, page-turning adventure where modern science and primordial supernatural powers collide.